Welcome to the Canadian River Municipal Water Authority website! For over fifty years, the Canadian River Municipal Water Authority (CRMWA) has worked to serve its member cities and all citizens of the Texas Panhandle and South Plains by providing a dependable and safe source of municipal and industrial water. 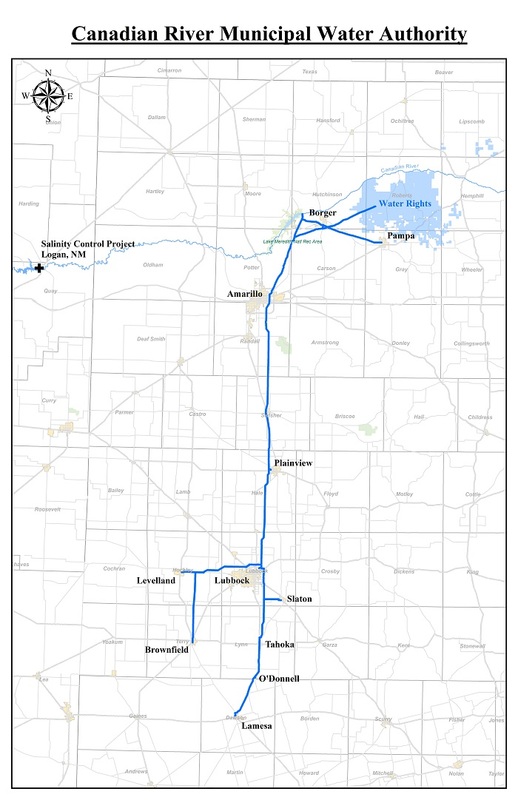 CRMWA supplies raw water to 11 member cities (over ½ million people) in the Texas Panhandle and South Plains via a 358-mile aqueduct system. The Authority’s current source of water is Lake Meredith and the John C. Williams Aqueduct & Wellfield in the Texas Panhandle. CRMWA was created by the Texas Legislature to provide a source of municipal and industrial water for its eleven member cities: Amarillo, Brownfield, Borger, Lamesa, Levelland, Lubbock, O’Donnell, Pampa, Plainview, Slaton, and Tahoka. The headquarters is located at Sanford Dam about 37 miles northeast of Amarillo, Texas. The project was built and financed by the Bureau of Reclamation in the mid 1960′s.